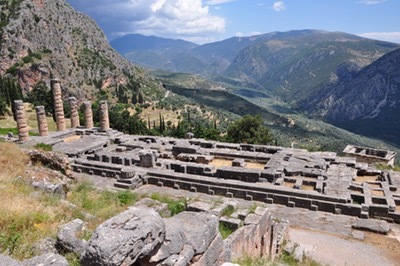 The Temple of Apollo was the central religious structure at Delphi. It was where the “omphalos” — the center of the Greek world — was located and it was here that the world famous “oracle of Delphi” was consulted. The temple foundations visible today are actually a “rebuild” of the third of three temples that stood on this site. It was built in the fourth century B.C. During the period leading up to its closing in A.D. 381 many of the treasures of Delphi were taken to the Byzantine capital Constantinople (modern Istanbul). Temples of Apollo have also been discovered at Corinth and an extremely well–preserved on at Didyma. To view an image of Apollo, from Olympia, Click Here.